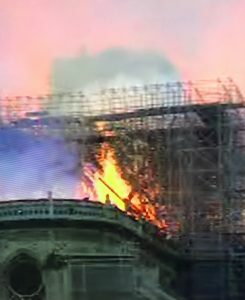 A major fire erupted at Notre Dame Cathedral one of France’s most famous medieval landmarks in Paris. 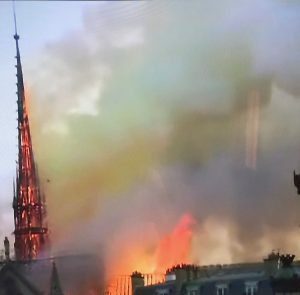 Its 750-tonne spire over the crossing and altar at the centre of the Cathedral and much of the roof has collapsed after it was engulfed in flames. 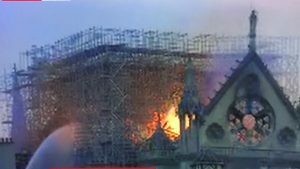 Although the cause of fire is not yet clear, but officials say that it could be linked to renovation of work being carried out at the nearly 850-year-old Gothic building. The landmark one of the French Capital’s best-known structures and one of the most visited tourist sites in the world was undergoing renovation. 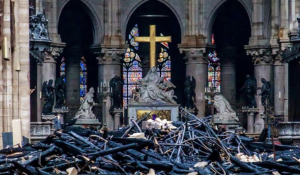 Only last year, the Catholic Church in France appealed for funds to save the building, which was crumbling. An area surrounding the cathedral has been cleared, while a major operation to tackle the blaze is underway. 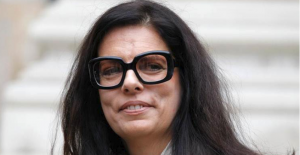 President Emmanuel Macron said on Twitter that the fire prompted the “emotion of an entire nation”.